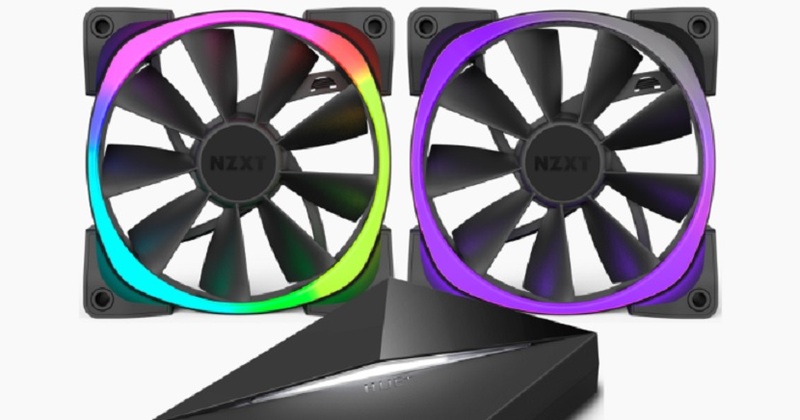 NZXT are well known for their cases and their Hue+ lighting kit, so the addition of RGB fans seems like a logical next step in their bid to make your PC look and feel cool. The Aer RGB LED PWM fans combine full digital illumination options with efficient cooling performance in one kit and work seamlessly with the current Hue+ box and CAM software. The Aer RGB fans are easy to install, going for the full set, the box contains the fans and the HUE+ as well as the connection cables and extension wires needed to chain fans together. The Hue+ box is connected to an internal USB 2.0 connection (so you’ll need an adaptor if you only have USB 3.0 headers on your motherboard, though a standard Micro USB 2.0 lead could be fed through from an external port if required), as well as to a Sata power connector. The box itself is just slightly taller than an SSD drive and is designed to fit in a 2.5″ drive bay to keep things neat and tidy inside your case. As the NZXT H440 case (recommended) comes with a small 2.5″ bay at the bottom of the case, this was the easiest place to install it. A connection cable is then fed to the first fan in the chain, wherever you decide to place it. The wire is, thankfully, long enough to give you plenty of choice without the hassle of stretching any wires. Here my one issue with installation appeared. The connection wire plugs in to an indented port on the fan (marked as ‘in’) but appeared to be very loose. Trying it in the other fan gave the same results. It worked, but being careful to place the fan and then screw it in to the housing of the case was tricky without moving the wire. It’s something that may have been only in my set, as I’ve not heard of anyone else having the same issue as yet, but it was annoying. The USB lead can also come loose on the back of the HUE+ box, as well, leading to the software not recognising the box, though this only happened once for me. Another wire then makes its way from the ‘out’ port on the other side of the fan to the next fan, with the ability to chain 5 fans from one connection port on the HUE+ (it has 2, giving you the ability for 10 fans, but ideally you’ll want to use one for the lighting kit). That’s it for hardware installation, pretty simple, really. Lighting strips from NZXT’s extension kit can be added to the Hue+, though we found the main connector kit missing. NZXT are aware of this and all new kits should have this included. If you already have the HUE+ lighting kit with the main unit you can actually buy the AER fans separately and connect them up that way. Once the fans are set up the CAM software needs to be installed from the link in the documentation. This gives you the ability to control both the fans, the HUE+ lighting strips (if installed) and also the recent Kraken CPU coolers. There are a range of preset patterns and colours with the ability to change and enhance these in different ways. I particularly liked the flickering candle effect and the marque effects which worked across all the chained fans in one long line. All the installed hardware, including the strips, can be set at the same time to provide a universal look or independently to show different colours and patterns. The AER 120 Fans are a great addition to the NZXT lighting range and provide both great cooling and an interesting look for your PC case. Aside from the loose connectors, the whole set is simple to install and versatile enough to go anywhere in the case.